Bell's palsy is a type of facial paralysis that results in an inability to control the facial muscles on the affected side. Symptoms can vary from mild to severe. They may include muscle twitching, weakness, or total loss of the ability to move one or rarely both sides of the face. Other symptoms include drooping of the eyelid, a change in taste, pain around the ear, and increased sensitivity to sound. Typically symptoms come on over 48 hours. A person attempting to show his teeth and raise his eyebrows with Bell's palsy on his right side (left side of the image; notice how the forehead is not spared). The cause of Bell's palsy is unknown. Risk factors include diabetes, a recent upper respiratory tract infection, and pregnancy. It results from a dysfunction of cranial nerve VII (the facial nerve). Many believe that this is due to a viral infection that results in swelling. Diagnosis is based on a person's appearance and ruling out other possible causes. Other conditions that can cause facial weakness include brain tumor, stroke, Ramsay Hunt syndrome, myasthenia gravis, and Lyme disease. The condition normally gets better by itself with most achieving normal or near-normal function. Corticosteroids have been found to improve outcomes, while antiviral medications may be of a small additional benefit. The eye should be protected from drying up with the use of eye drops or an eyepatch. Surgery is generally not recommended. Often signs of improvement begin within 14 days, with complete recovery within six months. A few may not recover completely or have a recurrence of symptoms. Bell's palsy is the most common cause of one-sided facial nerve paralysis (70%). It occurs in 1 to 4 per 10,000 people per year. About 1.5% of people are affected at some point in their life. It most commonly occurs in people between ages 15 and 60. Males and females are affected equally. 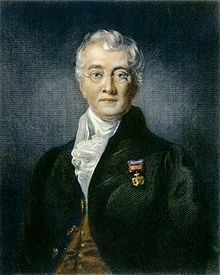 It is named after Scottish surgeon Charles Bell (1774–1842), who first described the connection of the facial nerve to the condition. Bell's palsy is characterized by a one-sided facial droop that comes on within 72 hours. In rare cases (<1%), it can occur on both sides resulting in total facial paralysis. The facial nerve controls a number of functions, such as blinking and closing the eyes, smiling, frowning, lacrimation, salivation, flaring nostrils and raising eyebrows. It also carries taste sensations from the anterior two-thirds of the tongue, via the chorda tympani nerve (a branch of the facial nerve). Because of this, people with Bell's palsy may present with loss of taste sensation in the anterior 2/3 of the tongue on the affected side. Although the facial nerve innervates the stapedius muscle of the middle ear (via the tympanic branch), sound sensitivity, causing normal sounds to be perceived as very loud, and dysacusis are possible but hardly ever clinically evident. Although defined as a mononeuritis (involving only one nerve), people diagnosed with Bell's palsy may have "myriad neurological symptoms" including "facial tingling, moderate or severe headache/neck pain, memory problems, balance problems, ipsilateral limb paresthesias, ipsilateral limb weakness, and a sense of clumsiness" that are "unexplained by facial nerve dysfunction". Facial nerve: the facial nerve's nuclei are in the brainstem (they are represented in the diagram as a „θ“). Orange: nerves coming from the left hemisphere of the brain. Yellow: nerves coming from the right hemisphere of the brain. 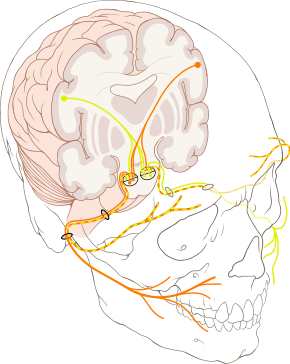 Note that the forehead muscles receive innervation from both hemispheres of the brain (represented in yellow and orange). The cause of Bell's palsy is unknown. Risk factors include diabetes, a recent upper respiratory tract infection, and pregnancy. Some viruses are thought to establish a persistent (or latent) infection without symptoms, e.g., the varicella-zoster virus and Epstein–Barr viruses, both of the herpes family. Reactivation of an existing (dormant) viral infection has been suggested as a cause of acute Bell's palsy. This new activation could be triggered by trauma, environmental factors, and metabolic or emotional disorders. Familial inheritance has been found in 4–14% of cases. There may also be an association with migraines. Bell's palsy occurs due to a malfunction of the facial nerve (cranial nerve VII), which controls the muscles of the face. Facial palsy is typified by inability to control movement in the muscles of facial expression. The paralysis is of the infranuclear/lower motor neuron type. It is thought that as a result of inflammation of the facial nerve, pressure is produced on the nerve where it exits the skull within its bony canal (the stylomastoid foramen), blocking the transmission of neural signals or damaging the nerve. Patients with facial palsy for which an underlying cause can be found are not considered to have Bell's palsy per se. Possible causes include tumor, meningitis, stroke, diabetes mellitus, head trauma and inflammatory diseases of the cranial nerves (sarcoidosis, brucellosis, etc.). In these conditions, the neurologic findings are rarely restricted to the facial nerve. Babies can be born with facial palsy. In a few cases, bilateral facial palsy has been associated with acute HIV infection. In some research, the herpes simplex virus type 1 (HSV-1) has been identified in a majority of cases diagnosed as Bell's palsy via endoneurial fluid sampling. Other research, however, identified, out of a total of 176 cases diagnosed as Bell's palsy, HSV-1 in 31 cases (18 percent) and herpes zoster in 45 cases (26 percent). In addition, HSV-1 infection is associated with demyelination of nerves. This nerve damage mechanism is different from the above-mentioned - that edema, swelling and compression of the nerve in the narrow bone canal is responsible for nerve damage. Demyelination may not even be directly caused by the virus, but by an unknown immune response. Bell's palsy is a diagnosis of exclusion, meaning it is diagnosed by elimination of other reasonable possibilities. By definition, no specific cause can be determined. There are no routine lab or imaging tests required to make the diagnosis. The degree of nerve damage can be assessed using the House-Brackmann score. One study found that 45% of patients are not referred to a specialist, which suggests that Bell's palsy is considered by physicians to be a straightforward diagnosis that is easy to manage. Other conditions that can cause similar symptoms include: herpes zoster, Lyme disease, sarcoidosis, stroke, and brain tumors. Once the facial paralysis sets in, many people may mistake it as a symptom of a stroke; however, there are a few subtle differences. A stroke will usually cause a few additional symptoms, such as numbness or weakness in the arms and legs. And unlike Bell's palsy, a stroke will usually let patients control the upper part of their faces. A person with a stroke will usually have some wrinkling of their forehead. One disease that may be difficult to exclude in the differential diagnosis is involvement of the facial nerve in infections with the herpes zoster virus. The major differences in this condition are the presence of small blisters, or vesicles, on the external ear and hearing disturbances, but these findings may occasionally be lacking (zoster sine herpete). Reactivation of existing herpes zoster infection leading to facial paralysis in a Bell's palsy type pattern is known as Ramsay Hunt syndrome type 2. Lyme disease may produce facial palsy. Sometimes the facial palsy occurs at the same time as the classic erythema migrans rash. Other times, it occurs later. In areas where Lyme disease is common, it may be the cause of facial palsy in half of cases. Steroids have been shown to be effective at improving recovery in Bell's palsy while antivirals have not. In those who are unable to close their eyes, eye protective measures are required. Management in during pregnancy is similar to the non pregnant. Corticosteroids such as prednisone improve recovery at 6 months and are thus recommended. Early treatment (within 3 days after the onset) is necessary for benefit with a 14% greater probability of recovery. One review found that antivirals (such as aciclovir) are ineffective in improving recovery from Bell's palsy beyond steroids alone in mild to moderate disease. Another review found a benefit when combined with corticosteroids but stated the evidence was not very good to support this conclusion. In severe disease it is also unclear. One 2015 review found no effect regardless of severity. Another review found a small benefit when added to steroids. They are commonly prescribed due to a theoretical link between Bell's palsy and the herpes simplex and varicella zoster virus. There is still the possibility that they might result in a benefit less than 7% as this has not been ruled out. Physiotherapy can be beneficial to some individuals with Bell's palsy as it helps to maintain muscle tone of the affected facial muscles and stimulate the facial nerve. It is important that muscle re-education exercises and soft tissue techniques be implemented prior to recovery in order to help prevent permanent contractures of the paralyzed facial muscles. To reduce pain, heat can be applied to the affected side of the face. There is no high quality evidence to support the role of electrical stimulation for Bell's palsy. Surgery may be able to improve outcomes in facial nerve palsy that has not recovered. A number of different techniques exist. Smile surgery or smile reconstruction is a surgical procedure that may restore the smile for people with facial nerve paralysis. It is unknown if early surgery is beneficial or harmful. Adverse effects include hearing loss which occurs in 3–15% of people. As of 2007 the American Academy of Neurology did not recommend surgical decompression. The efficacy of acupuncture remains unknown because the available studies are of low quality (poor primary study design or inadequate reporting practices). There is very tentative evidence for hyperbaric oxygen therapy in severe disease. Most people with Bell's palsy start to regain normal facial function within 3 weeks—even those who do not receive treatment. In a 1982 study, when no treatment was available, of 1,011 patients, 85% showed first signs of recovery within 3 weeks after onset. For the other 15%, recovery occurred 3–6 months later. After a follow-up of at least one year or until restoration, complete recovery had occurred in more than two-thirds (71%) of all patients. Recovery was judged moderate in 12% and poor in only 4% of patients. Another study found that incomplete palsies disappear entirely, nearly always in the course of one month. The patients who regain movement within the first two weeks nearly always remit entirely. When remission does not occur until the third week or later, a significantly greater part of the patients develop sequelae. A third study found a better prognosis for young patients, aged below 10 years old, while the patients over 61 years old presented a worse prognosis. Major complications of the condition are chronic loss of taste (ageusia), chronic facial spasm, facial pain and corneal infections. To prevent the latter, the eyes may be protected by covers, or taped shut during sleep and for rest periods, and tear-like eye drops or eye ointments may be recommended, especially for cases with complete paralysis. Where the eye does not close completely, the blink reflex is also affected, and care must be taken to protect the eye from injury. Another complication can occur in case of incomplete or erroneous regeneration of the damaged facial nerve. The nerve can be thought of as a bundle of smaller individual nerve connections that branch out to their proper destinations. During regrowth, nerves are generally able to track the original path to the right destination—but some nerves may sidetrack leading to a condition known as synkinesis. For instance, regrowth of nerves controlling muscles attached to the eye may sidetrack and also regrow connections reaching the muscles of the mouth. In this way, movement of one also affects the other. For example, when the person closes the eye, the corner of the mouth lifts involuntarily. Around 9% of patients have some sort of sequelae after Bell's palsy, typically the synkinesis already discussed, or spasm, contracture, tinnitus and/or hearing loss during facial movement or |crocodile tear syndrome. This is also called gustatolacrimal reflex or Bogorad's syndrome and involves the sufferer shedding tears while eating. This is thought to be due to faulty regeneration of the facial nerve, a branch of which controls the lacrimal and salivary glands. Gustatorial sweating can also occur. The number of new cases of Bell's palsy ranges from about one to four cases per 10,000 population per year. The rate increases with age. Bell's palsy affects about 40,000 people in the United States every year. It affects approximately 1 person in 65 during a lifetime. A range of annual incidence rates have been reported in the literature: 15, 24, and 25–53 (all rates per 100,000 population per year). Bell's palsy is not a reportable disease, and there are no established registries for people with this diagnosis, which complicates precise estimation. The Persian physician Muhammad ibn Zakariya al-Razi (865–925) detailed the first known description of peripheral and central facial palsy. Cornelis Stalpart van der Wiel (1620–1702) in 1683 gave an account of Bell's palsy and credited the Persian physician Ibn Sina (980–1037) for describing this condition before him. James Douglas (1675–1742) and Nicolaus Anton Friedreich (1761–1836) also described it. Sir Charles Bell, for whom the condition is named, presented three cases at the Royal Society of London in 1829. Two cases were idiopathic and the third was due to a tumour of the parotid gland. A notable person with Bell's palsy is former Prime Minister of Canada Jean Chrétien. During the 1993 Canadian federal election, Chrétien's first as leader of the Liberal Party of Canada, the opposition Progressive Conservative Party of Canada ran an attack ad in which voice actors criticized him over images that seemed to highlight his abnormal facial expressions. The ad was interpreted as an attack on Chrétien's physical appearance and garnered widespread anger among the public, while Chrétien used the ad to make himself more sympathetic to voters. The ad had the adverse effect of increasing Chrétien's lead in the polls and the subsequent backlash clinched the election for the Liberals, which the party won in a landslide. ^ a b c d e f g h i j k l m n o p q r s t u v w x y z aa ab "Bell's Palsy Fact Sheet". NINDS. February 5, 2016. Archived from the original on 8 April 2011. Retrieved 8 August 2016. ^ a b c d e f Fuller, G; Morgan, C (31 March 2016). "Bell's palsy syndrome: mimics and chameleons". Practical Neurology. 16 (6): 439–444. doi:10.1136/practneurol-2016-001383. PMID 27034243. ^ a b Madhok, VB; Gagyor, I; Daly, F; Somasundara, D; Sullivan, M; Gammie, F; Sullivan, F (18 July 2016). "Corticosteroids for Bell's palsy (idiopathic facial paralysis)". Cochrane Database of Systematic Reviews. 7: CD001942. doi:10.1002/14651858.CD001942.pub5. PMID 27428352. ^ a b c Hussain, A; Nduka, C; Moth, P; Malhotra, R (May 2017). "Bell's facial nerve palsy in pregnancy: a clinical review". Journal of Obstetrics and Gynaecology : The Journal of the Institute of Obstetrics and Gynaecology. 37 (4): 409–415. doi:10.1080/01443615.2016.1256973. PMID 28141956. ^ a b c Gagyor, Ildiko; Madhok, Vishnu B.; Daly, Fergus; Somasundara, Dhruvashree; Sullivan, Michael; Gammie, Fiona; Sullivan, Frank (2015-11-09). "Antiviral treatment for Bell's palsy (idiopathic facial paralysis)" (PDF). The Cochrane Database of Systematic Reviews (11): CD001869. doi:10.1002/14651858.CD001869.pub8. ISSN 1469-493X. PMID 26559436. ^ Dickson, Gretchen (2014). Primary Care ENT, An Issue of Primary Care: Clinics in Office Practice. Elsevier Health Sciences. p. 138. ISBN 9780323287173. Archived from the original on 2016-08-20. ^ Grewal, D. S. (2014). Atlas of Surgery of the Facial Nerve: An Otolaryngologist's Perspective. Jaypee Brothers Publishers. p. 46. ISBN 9789350905807. Archived from the original on 2016-08-20. ^ a b c d e Baugh, RF; Basura, GJ; Ishii, LE; Schwartz, SR; Drumheller, CM; Burkholder, R; Deckard, NA; Dawson, C; Driscoll, C; Gillespie, MB; Gurgel, RK; Halperin, J; Khalid, AN; Kumar, KA; Micco, A; Munsell, D; Rosenbaum, S; Vaughan, W (November 2013). "Clinical Practice Guideline: Bell's Palsy Executive Summary". Otolaryngology–Head and Neck Surgery. 149 (5): 656–63. doi:10.1177/0194599813506835. PMID 24190889. ^ Price, Fife, T; Fife, DG (January 2002). "Bilateral simultaneous facial nerve palsy". The Journal of Laryngology & Otology. 116 (1): 46–8. doi:10.1258/0022215021910113. PMID 11860653. ^ Jain V, Deshmukh A, Gollomp S (July 2006). "Bilateral facial paralysis: case presentation and discussion of differential diagnosis". Journal of General Internal Medicine. 21 (7): C7–10. doi:10.1111/j.1525-1497.2006.00466.x. PMC 1924702. PMID 16808763. ^ a b Mumenthaler, Mark; Mattle, Heinrich (2006). Fundamentals of Neurology. Germany: Thieme. p. 197. ISBN 978-3131364517. ^ Moore, Keith L.; Dalley, Arthur F.; Agur, A. M. R. (2013-02-13). Clinically Oriented Anatomy. Lippincott Williams & Wilkins. ISBN 9781451119459. ^ a b c Morris AM; Deeks SL; Hill MD; et al. (2002). "Annualized incidence and spectrum of illness from an outbreak investigation of Bell's palsy". Neuroepidemiology. 21 (5): 255–61. doi:10.1159/000065645. PMID 12207155. Archived from the original on 2009-07-13. ^ a b Furuta Y, Ohtani F, Chida E, Mesuda Y, Fukuda S, Inuyama Y (2001). "Herpes simplex virus type 1 reactivation and antiviral therapy in patients with acute peripheral facial palsy". Auris Nasus Larynx. 28 (Suppl): S13–7. doi:10.1016/S0385-8146(00)00105-X. PMID 11683332. ^ a b Kasse C.A; Ferri R.G; Vietler E.Y.C; Leonhardt F.D; Testa J.R.G; Cruz O.L.M (October 2003). "Clinical data and prognosis in 1521 cases of Bell's palsy". International Congress Series. 1240: 641–7. doi:10.1016/S0531-5131(03)00757-X. ^ a b Döner F, Kutluhan S (2000). "Familial idiopathic facial palsy". European Archives of Oto-Rhino-Laryngology. 257 (3): 117–9. doi:10.1007/s004050050205. PMID 10839481. Archived from the original on 2013-01-06. ^ Silberstein, SD; Silvestrini, M (13 January 2015). "Does migraine produce facial palsy? For whom the Bell tolls". Neurology. 84 (2): 108–9. doi:10.1212/WNL.0000000000001136. PMID 25520314. ^ Murakami S, Mizobuchi M, Nakashiro Y, Doi T, Hato N, Yanagihara N (1996). "Bell palsy and herpes simplex virus: identification of viral DNA in endoneurial fluid and muscle". Annals of Internal Medicine. 124 (1 Pt 1): 27–30. doi:10.7326/0003-4819-124-1_Part_1-199601010-00005. PMID 7503474. ^ a b c d Lorch, M; Teach, SJ (Oct 2010). "Facial nerve palsy: etiology and approach to diagnosis and treatment". Pediatric Emergency Care. 26 (10): 763–9, quiz 770–3. doi:10.1097/PEC.0b013e3181f3bd4a. PMID 20930602. ^ Hazin, R; Azizzadeh, B; Bhatti, MT (November 2009). "Medical and surgical management of facial nerve palsy". Current Opinion in Ophthalmology. 20 (6): 440–50. doi:10.1097/ICU.0b013e3283313cbf. PMID 19696671. ^ Gronseth, GS; Paduga, R (Nov 7, 2012). "Evidence-based guideline update: Steroids and antivirals for Bell palsy: Report of the Guideline Development Subcommittee of the American Academy of Neurology". Neurology. 79 (22): 2209–13. doi:10.1212/WNL.0b013e318275978c. PMID 23136264. ^ Turgeon, RD; Wilby, KJ; Ensom, MH (June 2015). "Antiviral Treatment of Bell's Palsy Based on Baseline Severity: A Systematic Review and Meta-analysis". The American Journal of Medicine. 128 (6): 617–28. doi:10.1016/j.amjmed.2014.11.033. PMID 25554380. ^ Turgeon, Ricky D.; Wilby, Kyle J.; Ensom, Mary H.H. (June 2015). "Antiviral Treatment of Bell's Palsy Based on Baseline Severity: A Systematic Review and Meta-analysis". The American Journal of Medicine. 128 (6): 617–628. doi:10.1016/j.amjmed.2014.11.033. PMID 25554380. ^ Sullivan FM; Swan IR; Donnan PT; et al. (October 2007). "Early treatment with prednisolone or acyclovir in Bell's palsy". New England Journal of Medicine. 357 (16): 1598–607. doi:10.1056/NEJMoa072006. PMID 17942873. ^ Gronseth, GS; Paduga, R; American Academy of Neurology (Nov 27, 2012). "Evidence-based guideline update: steroids and antivirals for Bell palsy: report of the Guideline Development Subcommittee of the American Academy of Neurology". Neurology. 79 (22): 2209–13. doi:10.1212/WNL.0b013e318275978c. PMID 23136264. ^ a b National Institute of Neurological Disorders and Stroke (NINDS) (April 2003). "Bell's Palsy Fact Sheet". Archived from the original on 8 April 2011. Retrieved 2011-05-12. ^ Shafshak, TS (March 2006). "The treatment of facial palsy from the point of view of physical and rehabilitation medicine". Europa Medicophysica. 42 (1): 41–7. PMID 16565685. ^ Teixeira, Lázaro J; Valbuza, J. S.; Prado, G. F. (Dec 2011). "Physical therapy for Bell's palsy (idiopathic facial paralysis)". Cochrane Database of Systematic Reviews (12): CD006283. doi:10.1002/14651858.CD006283.pub3. PMID 22161401. ^ a b Hazin R, Azizzadeh B, Bhatti MT (November 2009). "Medical and surgical management of facial nerve palsy". Current Opinion in Ophthalmology. 20 (6): 440–50. doi:10.1097/ICU.0b013e3283313cbf. PMID 19696671. ^ McAllister, Kerrie; Walker, David; Donnan, Peter T.; Swan, Iain (2013-10-16). "Surgical interventions for the early management of Bell's palsy" (PDF). Cochrane Database of Systematic Reviews (10): CD007468. doi:10.1002/14651858.CD007468.pub3. ISSN 1469-493X. PMID 24132718. ^ a b Tiemstra, JD; Khatkhate, N (Oct 1, 2007). "Bell's palsy: diagnosis and management". American Family Physician. 76 (7): 997–1002. PMID 17956069. ^ Chen, N; Zhou, M; He, L; Zhou, D; Li, N (4 August 2010). "Acupuncture for Bell's palsy". Cochrane Database of Systematic Reviews (8): CD002914. doi:10.1002/14651858.CD002914.pub5. PMID 20687071. ^ Holland, NJ; Bernstein, JM; Hamilton, JW (15 February 2012). "Hyperbaric oxygen therapy for Bell's palsy". Cochrane Database of Systematic Reviews. 2 (2): CD007288. doi:10.1002/14651858.CD007288.pub2. PMID 22336830. ^ Karnath, B. "Bell Palsy: Updated Guideline for Treatment". Consultant. HMP Communications. Archived from the original on February 25, 2013. Retrieved April 3, 2013. ^ Peitersen E (1982). "The natural history of Bell's palsy". The American Journal of Otology. 4 (2): 107–11. PMID 7148998. quoted in Roob G, Fazekas F, Hartung HP (1999). "Peripheral facial palsy: etiology, diagnosis and treatment". European Neurology. 41 (1): 3–9. doi:10.1159/000007990. PMID 9885321. Archived from the original on 2009-07-13. ^ Peitersen E, Andersen P (1966). "Spontaneous course of 220 peripheral non-traumatic facial palsies". Acta Oto-Laryngologica: Suppl 224:296+. PMID 6011525. ^ Yamamoto E, Nishimura H, Hirono Y (1988). "Occurrence of sequelae in Bell's palsy". Acta Oto-Laryngologica. Suppl 446: 93–6. PMID 3166596. ^ a b Ahmed A (2005). "When is facial paralysis Bell palsy? Current diagnosis and treatment". Cleveland Clinic Journal of Medicine. 72 (5): 398–401, 405. doi:10.3949/ccjm.72.5.398. PMID 15929453. ^ Wolf SR (1998). "[Idiopathic facial paralysis]". HNO (in German). 46 (9): 786–98. doi:10.1007/s001060050314. PMID 9816532. Archived from the original on 2000-06-23. ^ Sajadi MM, Sajadi MR, Tabatabaie SM (July 2011). "The history of facial palsy and spasm: Hippocrates to Razi". Neurology. 77 (2): 174–8. doi:10.1212/WNL.0b013e3182242d23. PMC 3140075. PMID 21747074. ^ van de Graaf RC, Nicolai JP (November 2005). "Bell's palsy before Bell: Cornelis Stalpart van der Wiel's observation of Bell's palsy in 1683". Otology & Neurotology. 26 (6): 1235–8. doi:10.1097/01.mao.0000194892.33721.f0. PMID 16272948. Wikimedia Commons has media related to Bell's palsy.